https://wetnosespetsitting.com/wp-content/uploads/2016/11/Boarding-in-Loveland.png 500 500 Liana Sanders https://wetnosespetsitting.com/wp-content/uploads/2017/05/wet-noses-logo-420x120.png Liana Sanders2017-02-27 05:44:392017-02-28 14:44:57Testimonials: "Their litter was nice and tidy"
We were very pleased with our Wet Noses Sitters experience, as were our two greyhounds ( they told us so). Things couldn’t have gone more smoothly. We appreciated receiving text message updates each day. It was far more comfortable for our dogs to remain at home rather than being boarded off site. It also was very nice to arrive home and have our dogs waiting as opposed to having to arrange to go pick them up somewhere. As a bonus, our mail and newspapers were collected and brought in and our outside lights were left on at night! We will certainly plan to use Wet Noses Sitters again in the future. I got back from trip to the mountains and Tiger Lilly was happy to see me. Jessica had left notes on each visit so that was great. Everything was neat and tidy, kitty plates were cleaned and dry, and safe kitty toys were on the floor to play with. Thank you for your attention to detail, great staff and follow-up. I will definitely rely on Wet Noses Sitters in the future. Andrea was very nice and she sent us photos and information each day, which was great! 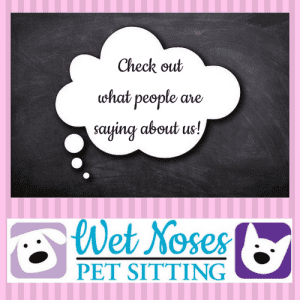 It made us feel very comfortable for our first time working with Wet Noses Sitters. I would recommend anyone to use your service. Sarah was awesome! I can’t begin to tell you how much of a relief it was to know our pets were being well taken care of. Sarah sent daily updates and there was a great summary when we got home. Her notes were a comfort and read like she had taken the time to get to know them and it sounded like she had fun with them. The house looked like she was never there (picked up and looking as we left it). 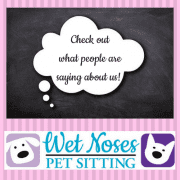 I love Wet Noses Sitters and would recommend this company to all of my friends in need of pet sitting. As we told Sarah, she did an amazing job! We cannot imagine anyone taking better care of our pets. The next time we go on vacation we will not hesitate to call Sidehill Sitters and request her specifically. Our house was left in better condition than we left it and our pets were very happy. You could definitely tell they had not only been well taken care of, but had also had fun! We have already recommended Sidehill Sitters to friends and family and definitely will continue to do so. We are very pleased customers! Jenslee was excellent! She checked in every day, played with Hoodoo and brushed her, and did everything as requested. The house was also clean and tidy when I got home. All of my experiences with Hannah and now Jenslee allow me to feel very comfortable leaving my pets in Wet Noses Sitter’s care when I’m away. I appreciate the great service! Hannah did a fantastic job, and Sebastian was clearly well-taken care of and as happy as he could be while I was gone. I have been very impressed with Wet Noses Sitters through all of my interactions. You have proven to be the most professional and caring pet setting service I have ever used. I am glad to be working with you. I really like the updates and reports I get when I return, and the apartment was is perfect shape when I got back. I love getting the daily updates and a picture or two. Traveling has been much easier with Wet Noses Sitters taking care of all details. My mind is more at ease with a cat needing daily medication.